MPS has revealed plans for their expansion into the floating offshore wind sector with two devices that offer a viable solution to wind energy generation in deep water locations. Established over 10 years ago, MPS is in the final stages of development for its wave energy device, WaveSub – designed to address the challenges of wave energy generation at sea. WaveSub’s stability in deep ocean water prompted MPS to explore its suitability for use as a platform for wind turbines, particularly in locations where wind speeds are high but water depths make a fixed base turbine too costly to install. 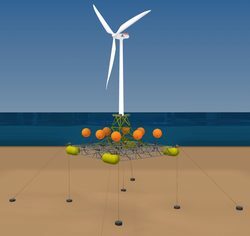 Initial tests showed that WaveSub offered a strong, stable platform on which a turbine could be installed, enabling the simultaneous capture of wave and wind energy from the ocean – essentially the WaveSub can be adapted to be a floating wind turbine and wave energy device in one. Following further R&D, MPS has developed two new devices; DualSub that captures both wave and wind energy, and WindSub that captures wind energy only. These devices have successfully completed prototype stability tests, detailed computational simulation and cost of energy modelling. Positive results have led MPS to accelerate the development of WindSub and DualSub to a scaled up prototype to bring them to the point of market readiness.